I took so many pictures at the Daphne Guinness exhibit, now at The Museum at FIT, that I wasn’t able to use them all in my original post. These pieces of fashion heaven are too beautiful to miss though, so I’m introducing Daphne Wednesdays to showcase some of my favorites. 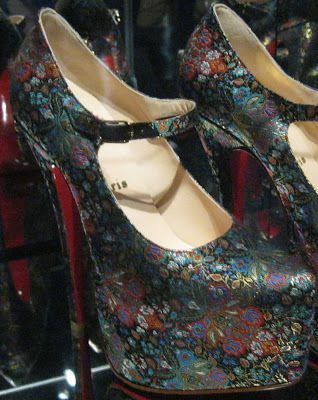 Today’s feature from Daphne’s closet is a gorgeous pair of Christian Louboutin high heel platform shoes of floral silk jacquard. I’m usually not a shoe gal but I would wear these in a heartbeat. The pattern is so sumptuous and wonderful and reminds me of cloisonné. I mean, right? I'm dying here, they are so beautiful. More, please!! Love the creativity! Fashion heaven is right. 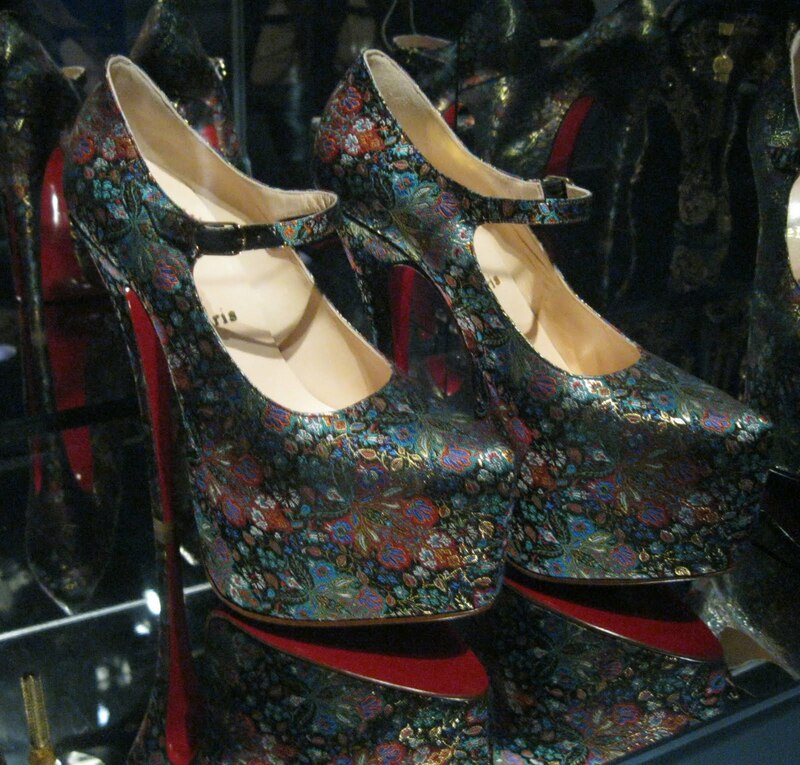 Those Mary Jane inspired Louboutin's are so fierce. The material looks like silk brocade. Beautiful! Love that your featuring your great pictures as Daphne Wednesdays. Thank you my dear Jill for sharing beauty. I should make a point of checking out this exhibit on my NYC trip! Daphne Wednesdays! I'm all over this idea, bless you. I definitely want to get to the exhibit while I can - fingers crossed. Those Loubis are just out of this world. Totally unreal! Amazing shoes! I now have something to look forward to on Wednesdays. Hi Pam, I will be doing these Daphne Wednesdays through October, I have so many great pictures. I think my photography skills are improving. Hi JTWisdom, the more I see these shoes, the more I want to put them on and wear them, even though I think I'd probably be 6'2 or 6'3 in them. Sacramento you are so funny, I am screaming right alongside you about these Louboutins! Hi Serene, you know, it didn't say it in the placard about the shoes in the exhibit but I'm sure they were specially made for Daphne. So very prive! Hi LR, you don't live in the city? I was sure you did. You HAVE to see this exhibit if you get to NYC by January 7, 2012. It's worth it and it's FREE! Hiya Casee Marie, thanks for stopping by. If you come back to the city and want company at this exhibit, let me know. I will meet you there. I'm serious! It would be fun to get together with you again. Bella! Thanks for the award, you are too nice. I'm working on my answers for next week. I can so totally see you wearing these shoes. You would look so hot in them honey! Oh this exhibit sounds really awesome- I must make out time to go see it! the remind me of cloisonne too! Too gorgeous to actually wear.